A bohemian tote bag with a mixture of vintage and embroidered fabric with genuine leather strap handmade in Thailand. This boho bag is the perfect shoulder bag for everyday use. This gorgeous unique large tote bag is handmade in Northern Thailand with a mixture of pink and red vintage fabrics from the Hmong Hill Tribes and embroidered fabric from Chiang Mai. 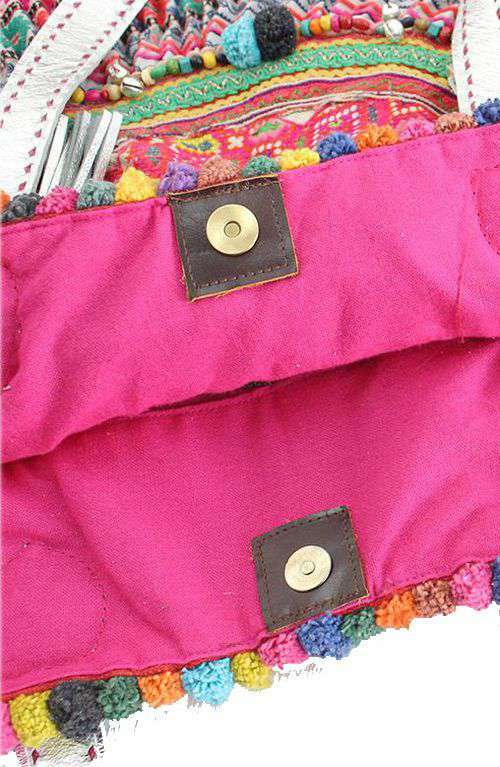 The boho bag features a leather strap with tassels and pom pom's for decoration. This shoulder bag has a magnetic closure and a 3 pockets inside which one of them is zippered. Please note that this bag is handmade to order and you will not receive the exact bag in the picture. As we use vintage fabric we will get the same style but the fabric may slightly vary!